In the last post, I talked about the value of thrifting to build up your creative toolbox. This time, I’m going to take a look at what happens when we keep some of the things we might normally toss into the trash or the recycle bin. I’m going to show you the value of having your own creative recycle bin. There are a few things you might be thinking. First, why would I want to keep trash? Second, where am I supposed to store this trash? Well, the possibilities for creative projects are nearly endless when it comes to recyclables and trash. And as they say, one person’s trash is another person’s treasure. How much space these things take up is entirely up to you. We have one small cube container filled with recyclables. This gets filled up, used and re-filled. M is never allowed to have more recyclables in the house than can fit in the container. She and I have a somewhat different definition of what fits, but that’s another story. The addition of recyclables to your toolbox will allow for more three-dimensional exploration, building sculptures, creatures and contraptions. If you have any engineering kits at home, you can mix those with cardboard or plastic to bring these experiments to life. Check out this claw machine that M and her dad made a few years ago. They made this using an engineering kit, an old moving box and a fishing rod. What else can you do with recycled materials? Pretty much anything. M loves to make spaceships from boxes. They vary in size. She makes them for her stuffed animals, for herself, and even sometimes for her friends. Moving and shipping boxes do take up a lot of room. We have a garage, so we have a place to keep a few boxes at a time. If you don’t have much space, boxes can be collapsed and tucked behind furniture until you’re ready to use them. Last summer, she made a parade float for her stuffed animals to ride on for the Fourth of July. M has also uses recyclables to make cute creatures and habitats for animals, like her toy T. Rex. Through the years, we’ve saved money on toys by making our own, like this play stove and microwave using an old box and some paper, or a climbing wall for a doll. Some of these creations are large and take up a bit of space. We don’t keep them forever. Most of them end up in the real recycling bin eventually, after we’ve taken a picture to document the work. These are just a few examples of what can happen when you keep recycled materials in your home. Your creations will likely look nothing like ours. What you choose to keep and how you choose to use what you’ve got will influence what your child creates. Obviously, we use a lot of boxes. M loves boxes. She just brought a random Amazon box home from school with her the other day, for no apparent reason. You and your child may prefer making towers out of yogurt cups or vases out of glass jars. The possibilities really are endless. Try holding on to a few things and see what happens. Mix these recyclables with your basic toolbox supplies, like markers, paint and glue. See what you come up with. Have you or your child made something cool with reclaimed or recycled materials? Let me know in the comments or post pictures on my Facebook page. Let me preface this post by saying that I’m very lucky to have several amazing thrift store options in my area that have added a lot to our creative toolbox over the years. I know that not everyone will have access to the same kinds of stores that I have in my area. Whatever you do have, scope it out. You never know what you might come across! A few weeks ago, I wrote a post about building your creative toolbox. That post listed out some basic supplies you might want to have on hand to allow for the free exercise of creativity in your home. I promised I would branch out from the basics and give you a few ideas for what you can add to your supplies to give you more creative options. There are entire stores devoted to creative supplies and you could really go crazy in a places like those…and spend a lot of money, too. I certainly have! That said, it is possible to add a wide variety of supplies to your toolbox without breaking the bank. My first secret is thrifting, buying supplies second-hand. Depending on what kind of stores you have in your area, you may find a wide variety of creative tools at a fraction of the cost. We are lucky enough to have stores in our area that specialize in craft and building supplies. We can find all kinds of things to use for creative projects. Even in thrift stores that don’t carry much in the way of paints, paper, yarn or stamps, you may find project pieces to re-purpose, like frames, vases or even small pieces of furniture. I find thrifting especially useful if there’s a new skill you’d like to learn or something you’d like to test out. Maybe you don’t want to spend a lot on supplies for something you’re not sure you or your child will enjoy. Knitting is a great example. I can usually find knitting supplies at at least two of my local thrift stores. Buying a pair of knitting needles and a bit of yarn is a small investment. If you try it out and love it, you can continue knitting with recycled craft material, or head over to that huge craft store and stock up on the latest trends. When M wanted to try finger knitting, we picked up yarn at the thrift store. When she wanted to start a sewing business, we got all of the fabric for handmade shopping bags from the thrift store. See that neat looking breakfast tray in the picture below? M and my husband made that out of an old cabinet door for me one Mother’s Day past. We recently started experimenting with using old books in our art pieces. We haven’t gotten too far yet, but we like the look. Books are readily available in most thrift shops. Look for titles that you enjoy. 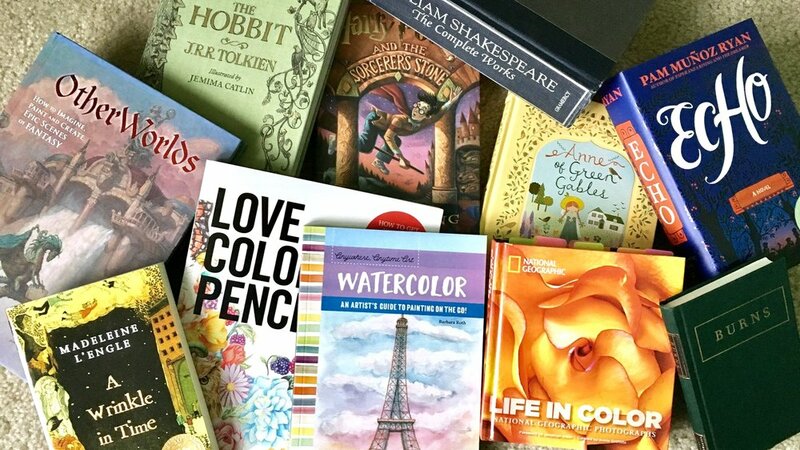 Keep them for reading, or turn them into your next masterpiece. I’ve also found thrifting to be a fantastic way to create unique Halloween costumes. I re-purposed a dress for M’s Lucille Ball costume and I made this Professor Snape costume almost exclusively using thrift shop components (except for the fabric for the cape and the wand I made from a stick in the yard). We used random finds from the ReStore to make a TARDIS console for M’s Doctor Who birthday party last year. There are just so many ways that thrifted pieces can make their way into your creative life. Supplies that you gather from thrift shops don’t have to take up too much space. M has a couple of bins filled with random bits from the ReStore and a tool kit. These inspire her when she’s in the mood to tinker. Things like fabric are tucked away on a shelf in the linen closet. You may find that some thrift store finds are immediately used, the project idea already formed. Next week, I’m going to explore another great way to stock up your tool box without spending much money. Stay tuned! Do you have fun thrift stores in your area? Let me know in the comments. When we’re ready to get started growing creative confidence in our kids and ourselves, access to creative supplies is crucial. The only way to flex that creative muscle is to exercise it. As with our bodies, where it’s easy to go overboard and spend too much money on physical fitness classes and equipment, you may think that collecting creative supplies will be expensive and out of your budget. It doesn’t have to be. Opening a creative space in your life doesn’t have to break the bank. You can start, and indeed continue, with just some basic supplies. What does a basic creative tool chest look like? Let’s compile a list of those starting supplies. 1. Pencils. You probably already have these at home. Most of us, especially those with kids, keep pencils in the house for schoolwork. The amazing thing about the unassuming pencil is its multi-functionality. This is a basic tool for writing and drawing. 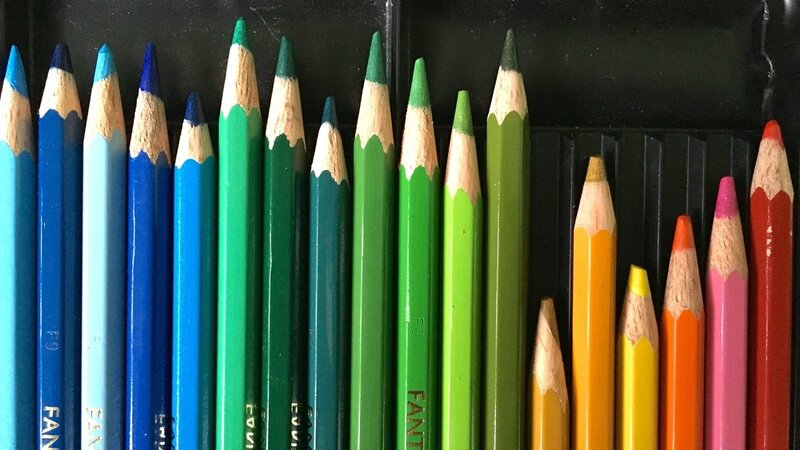 Think you need special pencils for sketching and drawing? You don’t. I did all of my early sketching and learning to draw with a simple #2 pencil that I used for school. You can certainly buy nice, and relatively inexpensive sketching pencils, but they aren’t necessary. You can get great results with the most basic pencil. Use this same versatile pencil for writing stories or poetry. So many great ideas can form on the tip of a pencil. 2. Paper. This is an obvious extension from the pencil. You can’t do much with a pencil unless you have some paper. This can be anything from notebook paper to a small journal for writing, jotting down ideas, creating epic stories. Computer paper or a sketchpad will work great for drawing, sketching, painting, making collages, whatever strikes your fancy. Construction paper is an inexpensive way to throw color into the mix and works great for practicing cutting and gluing skills with younger children. 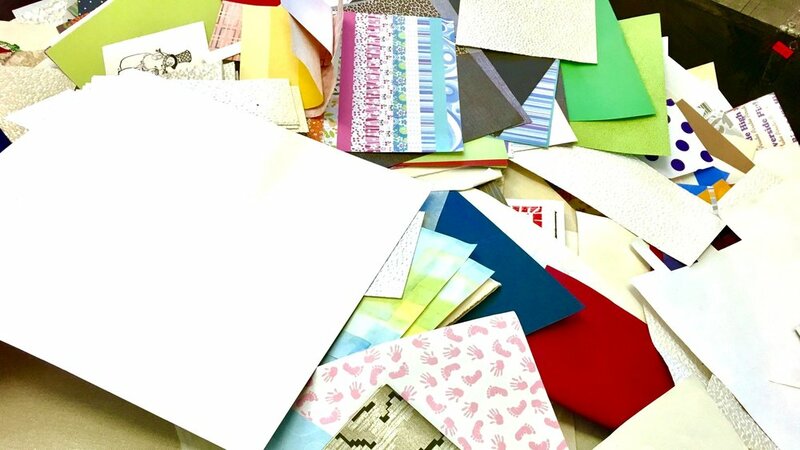 Generally speaking, paper is a small investment and you can probably keep a variety available to work with. 3. Crayons, markers or colored pencils. It’s always great to be able to add some color to a work of art. Starting with one of these simple, yet colorful, supplies will add another dimension to your creative space. What you decide to start with will depend on who’s using it. Small children work well with crayons. Markers add bold color. I personally love colored pencils, the way they blend and add varied texture. 4. Scissors. You’ll definitely want to be able to cut and you may already have this essential tool lying around your home. As a bonus, practicing with scissors is a great way for small children to develop fine motor skills. This is another tool that is inexpensive, but imperative. Unless you’ve got a very young child, be sure to get a pair of scissors with decent cutting power, to avoid the frustration of having a tool that can’t get the job done. 5. Glue and tape. Both are necessary tools for creation. Glue is great for everything from making a collage to building a recycled contraption. Again, the type of the glue you decide to keep in stock will depend on the age of who is using it. If you’re afraid of a mess, a glue stick is a good start, though limited in its application. There are great washable glues, as a bridge between a glue stick and a more permanent glue solution. Tape is also great for sticking things down. Clear tape, masking tape and double-sided tape all have their uses. 6. Paint. I suppose this one is debatable as a necessity, but it’s fun to have around and opens the door to a lot of experimentation and creation. I can’t imagine my creative toolbox without it. Paint not only adds color, but it introduces blending, mixing, swirling, dripping. Paint adds a dimension that you can’t get from the other supplies I’ve listed. Worried about the mess? I understand. Start with washable paints for small children. They are inexpensive and less of a risk, for the mess-averse. When you think your family is ready, get some cheap acrylic craft paint to add to the mix. They aren’t washable, but come in pretty much any amazing color you could want. 7. Books. I find books an essential toolbox element. This doesn’t mean that you have to invest a lot of money in a collection of creative references. There are many resources available at the library (a place where I spend a lot of time), or online if you don’t have access to a library. These books can cover any subject you desire. I get most of my inspiration from art books, poetry collections and well-written literature. Maybe you will find inspiration in books about interior design, architecture, music or photography. 8. Time. Yes, I know. This one isn’t really a tool at all, but I’m adding it to the list. There isn’t any point in keeping creative supplies around the house if you don’t have time to use them. So many of us lead busy lives. It’s hard to get everything done from day to day. Still, if you want to grow creative confidence, you have to find ways to set aside time to create. Whether a child or an adult, we all need time to devote ourselves to a project, to see it to a satisfying conclusion. Having the flexibility in your schedule to create when inspiration strikes is ideal. If that won’t work for you, schedule some creative time. Make it a priority. This is just a quick list of the first items you should keep around the house to encourage creation. If you start with these supplies, you’ll have a basic toolbox to get started. You can go forward from there, adding pieces to your own toolbox that inspire you and your family. I’ll talk about additional supplies in a later post, as well as how to maximize your creative toolbox with minimal financial investment. For now, you’ve got a place to start. Check out the video below to see some of the supplies we keep around our house, including a few that go beyond the basic. This will give you a feel for how you might expand, once you’re ready to dive in further.